Auburn has cultivated an off-field culture that is paying dividends with on-field success. Auburn, Alabama, is not a frisbee town. Like much of the South, there is no ultimate presence outside of the university, no recruiting pipeline, and no recreational city league. The population of Auburn could fit inside the university’s football stadium, and there is only one high school in the Auburn public school system. The city is in the old South, neighboring towns like Opelika, Tuskegee, and Beauregard. But, as is often the case with college ultimate programs, that all changed when a single class of guys came along. They were dedicated to transforming the culture at Auburn University. Three and a half years ago, Ultiworld published a piece1 that in part focused on the beginning of Auburn’s rise. After a strong showing at Classic City Classic in November of 2013, we peppered then-Aetos captains TJ Martin and Ryan Landry with questions about practice strategy and sustaining growth. While their answers focused on the fundamental skills and systems they were were drilling at practice, it was also clear that they seemed driven to build something that would outlast their own college career. Auburn made their first College Championships in 2015, when a roster mishap from Tulane gifted them the last of four bids for the Southeast. Despite barely making the tournament, Auburn managed to win a few games and finish tied for 13th. Last year, that same group returned to Nationals — they even won their pool this time, taking down the eventual national champions Minnesota Grey Duck in the process. Their run was ended by UNC Darkside in the quarterfinals, but Auburn had gone from failing to win a weak college section to Nationals qualifiers to Nationals quarterfinalist in just three years. 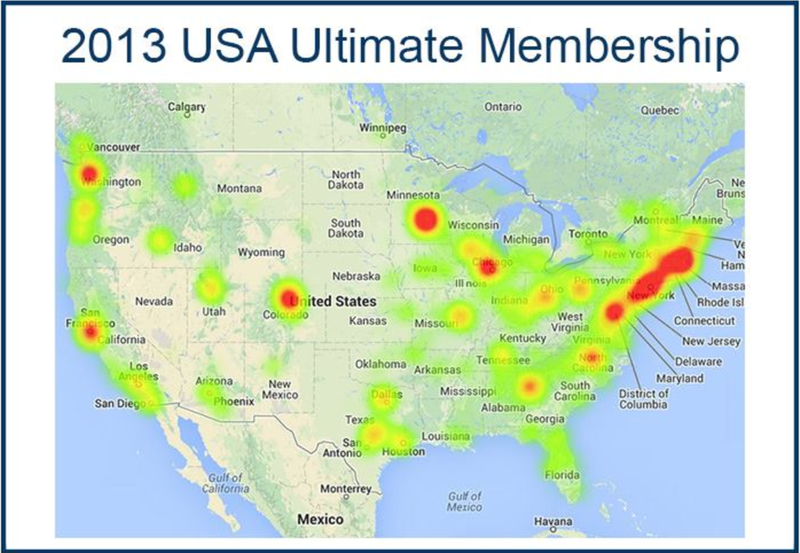 Back in 2013, USA Ultimate released a heat map of membership across North America. Besides the hotbed of Atlanta in Georgia, much of the rest of the South was a desolate wasteland of membership. The city of Auburn had 43 total members registered with the national governing body. This was the scene as the Auburn University Aetos began to rise to national prominence. 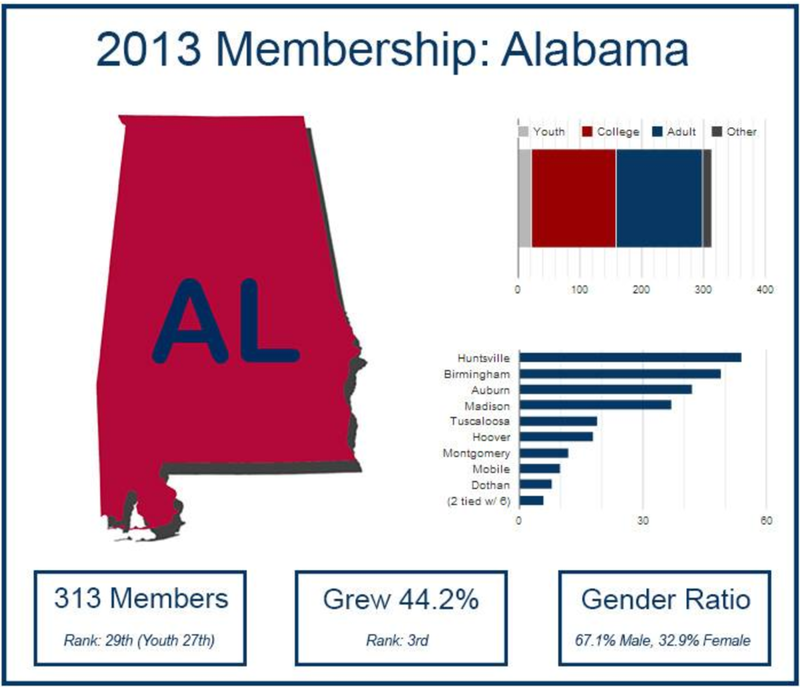 Youth membership across the region was weak, but Alabama stood out with some staggeringly small numbers — there were only 21 youth members in the entire state. Despite those numbers, Auburn fielded a nearly full team of in-state students the following year. Four of those teammates would go on to become the core of a transforming culture at Auburn: Ryan Landry, Blake Galloway, Evan Boecking, and Garris Bugg, all from Alabama. Every ultimate player has had moments when describing the sport can be arduous. Older generations will ask if we “play catch with the dogs” and some will automatically label players “hippies.” In much of the country, that perception is slowly changing. If you happen to play at a college with a rich ultimate history or at high school near a major ultimate hub, the sport is now generally accepted as a legitimate athletic pursuit. Perhaps your results are even publicized in local news outlets alongside other sports scores. But that old-school perception has always been intensified in the South, with other sports — mainly football — playing such a dominant role in college culture. And it’s not just other sports that steal away potential players. In southern universities, even some people who come in with a high school ultimate or a YCC background will quickly set aside the sport for a fraternity or sorority and never set foot on the field outside of weekend pickup. Universities like recent Nationals qualifier Oregon State have a Greek involvement that hovers around ten percent; at Auburn, one out of four undergraduate men is involved in a fraternity. Nearby schools like Alabama and Ole Miss are even more reliant on Greek life, with percentages in the high thirties. So how does a traditionally liberal, progressive sport overcome cultural adversity in the old South and establish itself for the long-term? Galloway, Boecking, Landry, Bugg, Martin, Boyd, and Brandon all hammered in nails to build the Auburn ship. Their play on the field and leadership off it transformed the program into one that was raring to join the ranks of the steady Southeast contenders. Hank Womble pushed the ship into the water. While he has played only a few points for Aetos in his career, Womble has been an integral part of Auburn’s success for years. One class of talented, committed players can build a new ultimate team to compete over the four years they are in school. But in order to build a lasting program, it is critical to create a sustainable culture that attracts and retains players — and can be continued beyond any one class’ tenure. That’s exactly what Womble has done for Auburn. The Auburn sideline has always been loud and intimidating, but over time this group of players has started to push the limits. They are typified by Womble, who made waves last year with his relentless energy and trombone playing from the sidelines at the College Championships. 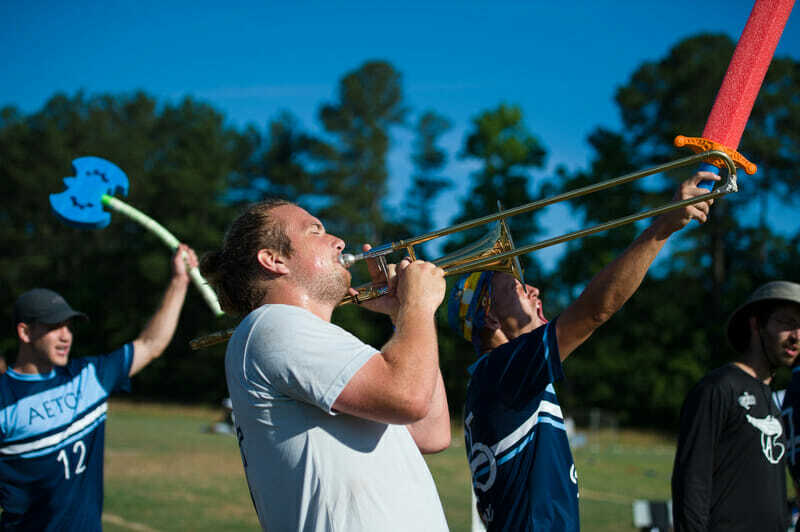 Womble’s return to the team year after year is more important than you might think; his trombone has become a rallying call for the entire program. When Auburn played Notre Dame at Huck Finn last year, Womble was inspired by their use of actual ceremonial sabres as sideline props. He knew he needed to step up his game, so he started developing a plan. When Auburn qualified for Nationals, the trombone was at every game. It was an unwavering presence that made the team feel comfortable in even the most high-pressure situations. They sustained that feeling all through Nationals. When they were scored on, they cheered even louder. It can quickly demoralize a team and take a run of breaks to the next level. And they didn’t even limit their energy and enthusiasm to their own games. After the team had been eliminated, Womble brought his trombone with him to the Saturday night semifinal showcase games. His musical stylings led the entire crowd in raucous cheers and songs, adding to the already incredible atmosphere provided by the crazy rain storm and epic on-field action. That kind of experience can stand as a lodestar moment for a team culture. With Womble back this year, his galvanizing efforts may do as much to mitigate the personnel losses as any of the on-field contributors. Luckily for Auburn, they have built a program that has invested not just in the top end of their roster but in creating an environment where everyone feels valued and committed to improvement. Gaining exposure to the habits of the top teams in the country over the past couple years, Auburn has learned to invest in depth and find ways to increase buy-in. Central to Auburn’s rise has been not just the talent of the players on the field but also the support of the community they have built. They have a B-team that practices with them and has the option to travel with the A-team, unrostered, to participate as a sideline presence. That policy has produced impressive results. Anyone who has played Aetos over the past couple seasons has come away equally impressed by the size and energy of the sidelines as by the skill of Ryan Landry and company. It’s hard to forget playing them when the 20-30 reinforcements on the bench make their sideline one of the biggest and most boisterous in college ultimate. At many tournaments, Auburn has more sideline-only participants than Oregon had players on their 2015 roster. Auburn is heading into Regionals this weekend after a lackluster regular season. But over the last three years, they’ve successfully demonstrated that they cannot be counted out. With only one bid in the region, the path has to go through Georgia. Even if they get there, they won’t be favored in that game by any stretch of the imagination. Good luck convincing them of that. Comments on "Turning Fluke Into Tradition: Auburn’s Rise In An Ultimate Desert"